BEWARE OF Empire Today, CHICAGO, IL - NEED REFUND! We never want our customers to be disappointed in our services, and we regret the lack of follow up you received. It’s our understanding that we have spoken with you about this issue. For future questions or concerns please contact us at customersupport@empiretoday.com. 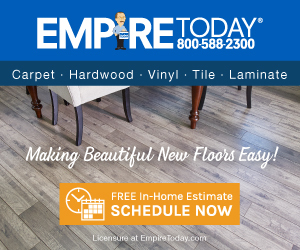 I have been duped by Empire carpet recently. I felt pity on this lame salesman and was conned into buying a so called Mercedes of the carpets. I agreed to pay $3000.00 cash including the installation. People who did the installation did an awesome job but the problem started after two days when massive amounts of lint started to come out of the carpet. The lint is in everything, in food, sticks to clothing, just everywhere. If this is their top of the line carpeting then who knows what their common household carpet is like? I called them and filed a complaint; they said its normal watch for 2-3 weeks and call us back. I waited, vacuuming, and removing the container full of lint each time every two to three days max. After 4 weeks finally I was able to get hold of them. They said we will send a professional cleaner to take care of the issue. They showed up next week and did the cleanup and they too were surprised at the massive amount of lint but they did their job and left. I was happy assuming that the problem was fixed now that it's been washed, but to my surprise the lint continues to come out again. I got upset and called them again. They sent yet another rep to take some pictures to make a case for the supplier, weeks passed no reply. I called them again they said there will be another 3rd party inspection. Holy ***! How many inspections???? Each time we have to take a day off just for these people to show up and then say it's not their call it's someone elses, how unprofessional! After almost close to 200 days they came to a conclusion that the carpet has no defect. I had to call in to find this out; they never cared to bother calling me and informing me about this. Today I called them and asked for the refund so the lady said I will transfer you to the specialist, I waited for 15 darn minutes and nobody took my call. It is clear to me now that these people are a big rip off . I am going to get my refund no matter what. I am going to take legal action if they refuse and I will reach out to every website possible to spread the awareness about Empire scams until I get my full refund. My humble request to everyone out there, buy your carpet from any place you like, just don’t give your business to Empire. Review #533407 is a subjective opinion of User533407. Hi Syed, thank you for bringing your concerns with your product to our attention. We never want our customers to be disappointed in our service, and we regret the lack of follow up you received. It’s our understanding that we have now been in contact with you about this issue and that we are currently working towards a resolution. Please do not hesitate to contact us with any additional questions or concerns.